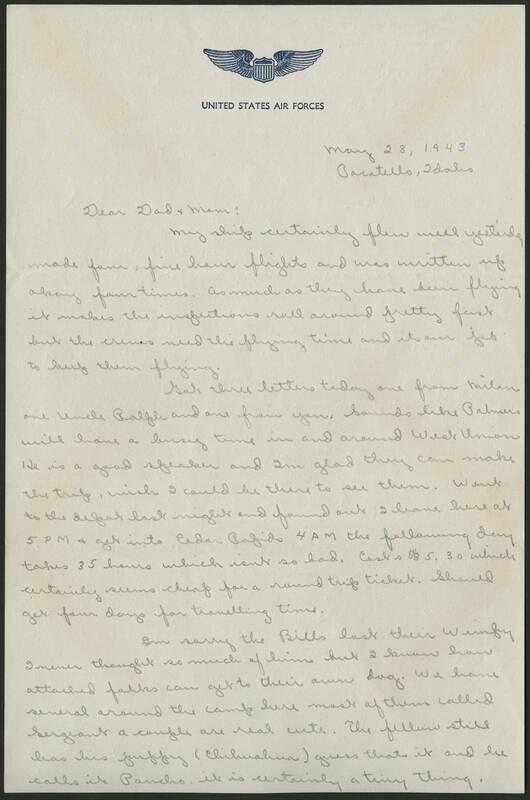 May 28, 198\43 Pocatello, Idaho Dear Dad + Mom: My ship certainly flew well yesterday made four five hour flights and was written up okay four times. As much as they have been flying it makes the inspections [?] around pretty fast but the crews need the flying time and its our job to keep them flying. Got these letters today one from Milan? and Uncle Ralph and one from you. Sounds like Palmers will have a busy time in and around West Union. He is a good speaker and Im glad they can make the trip, wish I could be there to see them. Went to the depot last night and found out I leave here at 5PM + get into Cedar Rapids 4AM the following day takes 35 hours which isn't so bad. Cost is $35.30 which certainly seems cheap for a round trip ticket. Should get four days for travelling time. Im sorry the Bills lost their [Winfry?] I never thought so much of him but I know how attached folks can get to their own dog. We have several around the camp here most of them called Sergeant a couple are real cute. The fellow still has his puppy (Chihuahua) guess that it and he calls it Poncho it is certainly a tiny thing.